“To be clear; I am a believer in decentralization. Having built systems with that I can tell you it is not the magic dust you are looking for.” — Amazon Web Services Chief Technology Officer Werner Vogels. As we gear up to release our next e-book on the Kubernetes open source container orchestration engine (check with us in about a month), we have been reviewing how well K8s has been making its way into the enterprise — the true determinant of whether the software becomes an essential component of “the new stack,” so to speak. Comcast has found that not only does Kubernetes easily scale applications, but even helps scale IT operations teams. Its use of Kubernetes is all about “decoupling the operations of [engineering] teams at an organization, and giving them a platform to manage their own large, complicated distributed systems as easily as I can manage my Linux box,” Comcast’s Richard Fliam said. Not only would this approach cut deployment time for apps, it also cuts the amount of time staff has to spend in documentation and the communication required across groups. Elsewhere we found that — surprise! — even Microsoft is using Kubernetes, which it needed to quickly road-test the then upcoming release of a version of SQL Server 2017 that was ported to Linux . Originally, it would take Microsoft an entire night to run 700-800 tests of the containerized SQL Server. With Kubernetes, however, the time needed to complete those tests shrank to a few hours. According to Module Counts, the total number of unique Node.js modules surpassed Java in 2014 and now outpaces 3 million to 2 million. 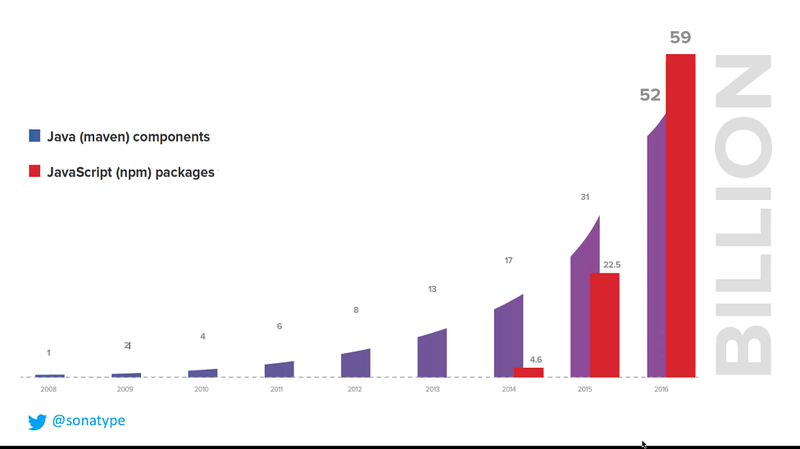 Node.js continues to grow its user base and complexity, but the continued increase in downloads per year is also related to the shortening application release cycles. Looking to the future, npm downloads per user per month will be an interesting stat to monitor. How does open source change in the cloud? This week in the New Stack Makers, we spoke with Apache Software Foundation co-founder Jim Jagielski about the Free Software Foundation’s Affero GPL, a version of the GPL that specifically covers cloud use of free software. TNS out-and-about on the tech scene. 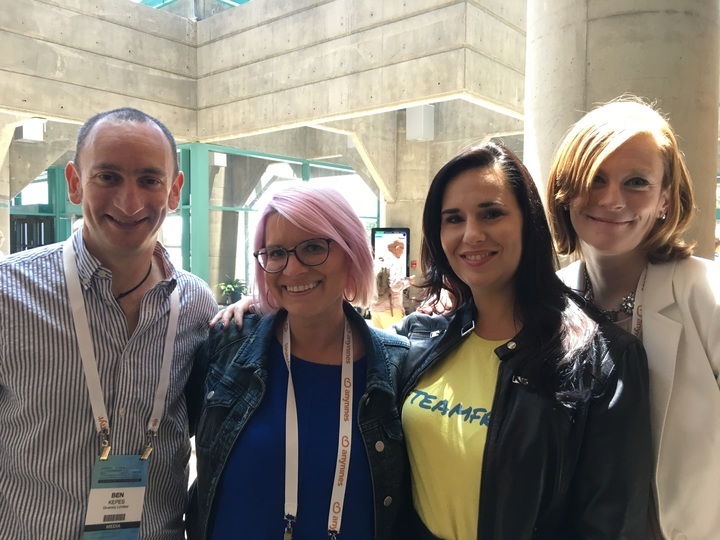 Cloud Foundry Summit 2017: (Left to right): Ben Kepes, independent analyst; Ashley McNamara, Pivotal; Kim Bannerman, Google and Lauren Cooney of Equinix (Photo by Alex Williams). The feature image above is a detail shot from Christine Vella’s “Saltbrush Dam,” an oil painting now being shown at Agora Gallery in New York ($1,700). 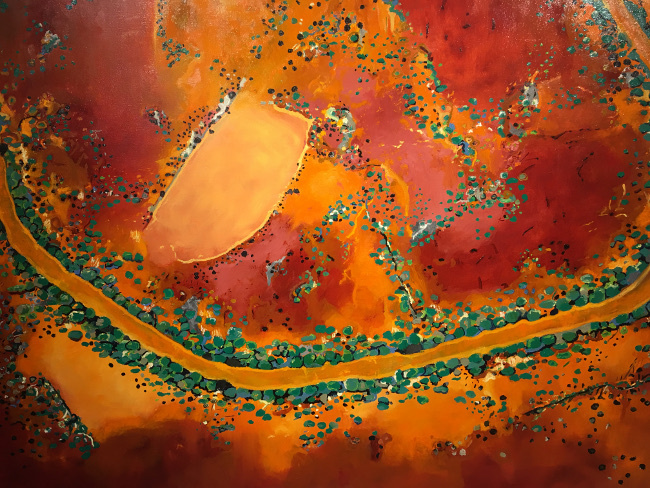 Vella’s abstract paintings use “the textures and colors of the Australian outback to create patterns that express the landscape’s essence,” according to the artist.